President Barack Obama committed the United States to providing the Gulf nations with technical assistance against external attacks and to supporting efforts to develop region-wide ballistic missile defense capability. Obama said he and Gulf partners had “candid” talks about Iran’s “destabilizing activities in the region,” as well as the Islamic State and other security matters. The president delivered his remarks following a meeting with delegates from the Gulf Cooperation Council (GCC) at Camp David on Friday. The Council includes six Persian Gulf nations: Saudi Arabia, Qatar, Kuwait, Oman, Bahrain and United Arab Emirates. 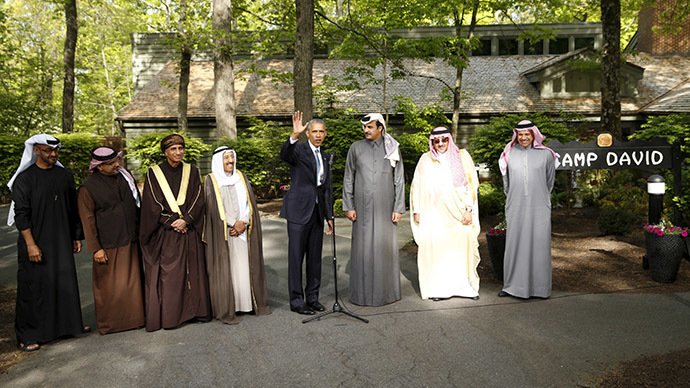 "I was very explicit that the United States will stand by our GCC partners against external attacks," said Obama. The US-GCC reviewed the negotiations over Iran’s nuclear program and agreed that it is in the "security interests of GCC member states, US and international community." They stressed the need for Iran "to engage the region according to the principles of good neighborliness strict non-interference in domestic affairs, and respect of territorial integrity." In a joint US-GCC statement, the US agreed to provide support for "the political independence and territorial integrity, safe from external aggression, of our GCC partners." Gulf States stated they will consult with the US "when planning to take military action beyond GCC borders," especially when US assistance is requested for such action. Under the agreement, they will work towards increased security cooperation, particularly "on fast-tracking arms transfers…counter terrorism, maritime security, cybersecurity and ballistic missile defense." This cooperation will involve sharing information on threats from the Islamic State and Al-Qaeda, and trying to disrupt terrorist attacks on infrastructure, border and aviation security. It will also aim to block financing for foreign fighters and set up preventive measures against violent extremism. The US-GCC also discussed regional conflicts in Syria, Iraq, Yemen and Libya, and agreed there is no military solution to the armed civil conflicts. Concerning Yemen, delegates said military operations should rapidly shift to "a political process through the Riyadh Conference" and UN-facilitated negotiations, and welcomed the start of "a five-day humanitarian pause to…[deliver]…relief assistance to … those in need." In Iraq, the US and GCC members agreed to assist the Iraqi government in their fight against ISIS and to seek a sustainable political resolution in Syria. In Libya, they agreed to convince political parties to accept a power-sharing agreement put forward by the UN to counter terrorism, which is growing in the region. Summit participants agreed to another meeting in 2016.